We proudly present CL22. The elegant and masterpiece of modern design, using smoked black glass and brushed aluminum, offers a huge variation of delicious coffees and hot drink specialties. 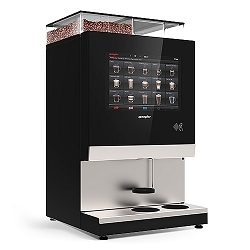 Surprise your customer with the unique Coffeebar taste & quality! • 2 Grinders & bean hoppers. • 2 Ingredient canisters. • 1 Espresso brewing unit & 1 filter brew unit. • A++ Rating. • 15" Touch screen. • Hot water outlet.